Simply, put it is a 3D barcode. QR Codes are popping up everywhere and are gaining in popularity in education. You will need a reader installed on your phone. There are lots to choose from and most are free. For the iPhone there is NeoReader. On Android the Barcode Scanner from Zxing is very popular. But NeoReader works on most Android phones as well. There are other apps too for non-smartphones. Just do a Google search for your phone and "qr code reader" and you should come up with something. There are lots of different websites that will allow you to make QR codes. Kaywa is a favorite as well as QR Code Generator. Drop in the website you want the user to be directed to (or other information like general text, phone number, or SMS message) click Generate! A QR Code you can embed or print anywhere. If you think this is cool we encourage you to try using QR Codes in your classroom and teach your students to use them for assignments and/or homework. We are always here to assist you if you need help. Just stop by! Interesting Ways To Use QR Codes In The Classroom-This presentation, started by the amazing Tom Barrett, has over 28 ways to use QR Codes in the classroom. Best thing here? If you come up with a different way in the presentation, you can add your idea. Using QR Codes To Tell A Story- This post I saw just the other day has several ideas on how students can create and use QR Codes to tell stories. Lots of lesson ideas and more QR Code resources here. 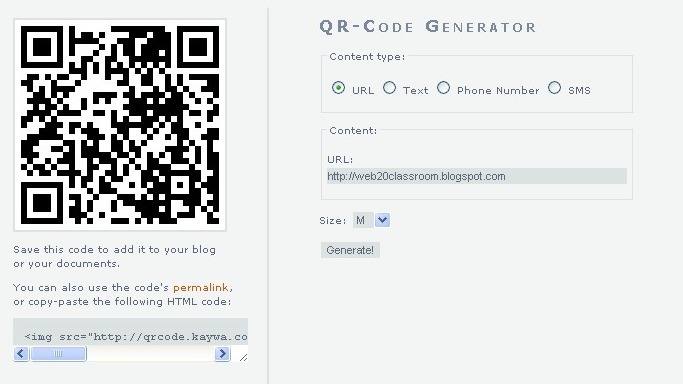 Using QR Codes In Student Projects-The ladies over at Simple K12 recently wrote about post about using QR Codes in the classroom and give some quick examples. There are also some great ideas in the comments so be sure not to miss those.